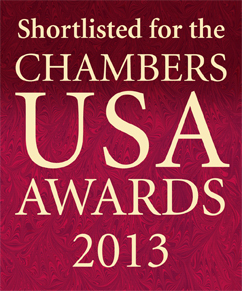 Chaffetz Lindsey Recognized Among the Best in the U.S.
March 2013 – Chaffetz Lindsey has been short-listed once again for International Arbitration team of the year by the Chambers USA Awards for Excellence 2013. The Awards recognize outstanding law firms based on research carried out for Chambers USA and reflect a law firm’s pre-eminence in their field and notable achievements over the past 12 months, including outstanding work, impressive strategic growth and excellence in client service. For more information about this year’s nominees, please click here.